Who invented the Submarine? The name of the person credited with inventing the first successful Submarine is Cornelis Drebbel (1572 - 1633), a Dutch "court inventor" for King James I of England. Cornelis Drebbel built his submarine and it was submerged under the River Thames for three hours at a depth of 15 feet. When was the Submarine invented? Believe it or not, Cornelis Drebbel invented the Submarine way back in 1620, during the Renaissance period of inventions (1350 to 1700). Cornelis Drebbel is not only famous as the Dutch inventor of the submarine, but also as a engraver, artist, glassworker and an expert in optics. Definition of the Submarine: The Submarine is defined as a submersible, navigable warship, usually armed with torpedoes, that is capable of operating at various depths and of traveling substantial distances under water. Origing of the word Submarine: The word 'submarine derives from the Latin word 'sub' meaning "from under, beneath" and from the Latin word 'marinus' meaning "of the sea". Fact 1: Who invented the Submarine? The Submarine was invented by Cornelis Drebbel in 1620 during the Renaissance era of inventions (1350 to 1700). Fact 2: Who invented the Submarine? Prior to the invention of the Submarine in 1620, Leonardo da Vinci (1452-1519) had sketched a primitive submarine around 1515. The Englishman William Bourne (c. 1535–1582), a former Royal Navy gunner, drafted the first design for a submersible craft in 1578. Fact 3: Who invented the Submarine? The inventor of the Submarine, Cornelis Drebbel, was born on 1572 in Alkmaar, Netherlands and died on November 7, 1633. Fact 5: Who invented the Submarine? Following his education his first job was as a an apprentice to a celebrated engraver and artist called Hendrick Goltzius (1558-1617) who became the leading Dutch engraver of the early Baroque period. Cornelis Drebbel went to work and live at his house at Haarlem. Fact 6: Who invented the Submarine? Cornelis Drebbel worked hard and gained considerable knowledge from Hendrick Goltzius in art, engraving, optics and map making. Hendrick Goltzius was a true Renaissance man, devoted to the study of alchemy and new ideas and inventions. Goltzius passed his passions on to Cornelis Drebbel. Fact 7: Who invented the Submarine? Hendrick Goltzius encouraged and apparently got on extremely well with his protégé and in In 1595 Cornelis Drebbel married his young sister, Sophia Goltzius. The couple went on to have four daughters. Fact 8: Who invented the Submarine? Cornelis Drebbel was a talented man and quickly made a name for himself as an excellent engraver and cartographer. However, his real interest was in inventions and in 1598 designed a pump and a clock with 'a perpetual motion'. Several other successful inventions followed and Cornelis Drebbel decided to expand his horizons and expand his career as an inventor in England. Fact 9: Who invented the Submarine? In 1604 Cornelis Drebbel was taken into the special service of Henry, Prince of Wales (1594-1612) and then appointed as "court inventor" for King James I. His job included the role of an 'entertainment manager' organising firework displays and royal events. He invented a variety of different items including the improvement of the magic lantern, the clavichord and other musical instruments. He became famous across Europe for his invention of perpetual motion clock (Perpetuum Mobile). Fact 10: Who invented the Submarine? King James had many enemies, he was a staunch Protestant and the possibility of war with Catholic countries was ever present. Cornelis Drebbel invented the Submarine to destroy enemy ships should war ever break out - but his submersible vessel was so amazing that it was demonstrated to King James, and thousands of spectators along the River Thames. Fact 11: Who invented the Submarine? Cornelis Drebbel began his work that culminated in his invention of the Submarine in 1619 and achieved his goal in 1620. Fact 12: Who invented the Submarine? 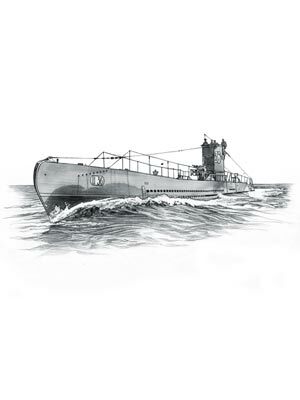 Cornelis Drebbel's invention of the Submarine was clouded in secrecy, as were all of his inventions. He was intensely cautious, secretive and highly protective of his ideas. Cornelis Drebbel kept no scientific notebooks, nor did he leave any drawings of his devices. Fact 13: Who invented the Submarine? Specific details of the functionality of his submarine are therefore subject to educated guesses, although eye witness reports detailed the overall description of his device. Fact 14: Who invented the Submarine? Cornelis Drebbel's invention of the Submarine was based on the design of a fully covered wooden rowing boat. The submersible vessel was divided into upper and lower chambers and covered in watertight greased leather to promote buoyancy, with a hatch in the middle, a rudder and oars. Fact 15: Who invented the Submarine? Rowers sat in their seats under which there were large pigskin bladders that were connected by pipes to the outside. Rope was used to tie off The empty bladders were tied with rope and in order to dive, the rope was untied and the bladders filled with water. To surface the submarine the rowers squashed the bladders flat to squeeze out the water, lightening the vessel enabling it to surface. Fact 16: Who invented the Submarine? Cornelis Drebbel's submarine was demonstrated on the River Thames in London in 1621 watched by King James, the court and thousands of Londoners. The submersible vessel made a round trip from Westminster to Greenwich and back. The journey took three hours at a depth of 15 feet. Fact 17: Who invented the Submarine? The description of Cornelis Drebbel's submersible vessel sounds feasible but there is no way of knowing how enough of an air supply and oxygen was maintained to keep the rowing crew alive for three hours. Fact 18: Who invented the Submarine? Several theories have been suggested as to how Cornelis Drebbel solved the oxygen question. It is known that Cornelis Drebbel was an alchemist and it is probable that he had found that heated saltpeter produced "the elixir of life" - now known as oxygen. His isolation and manufacture of oxygen took place 150 years before the British scientist, Joseph Priestley (1733–1804), officially discovered it. Fact 19: Who invented the Submarine? Between 1620 and 1624 Cornelis Drebbel built three submersible vessels, each one larger than the previous. His largest submarine housed a crew of twelve rowers. Fact 20: Who invented the Submarine? After successfully demonstrating his submarine on the River Thames Cornelis Drebbel found his services gradually requisitioned for the navy went on to invent watermines and a floating bomb containing grease, tar, and gunpowder for the English Navy's fireships. Fact 21: Who invented the Submarine? The value of his work was never fully recognized during his lifetime. Cornelis Drebbel was forced to become a brewer and an innkeeper to supplement his income. Fact 22: Who invented the Submarine? Cornelis Drebbel died on November 7, 1633 in the parish of Trinity Minories, now known as Tower Hamlets, outside the eastern boundaries of the City of London. Who Invented the Submarine - Cornelis Drebbel - Inventor - Invention - Definition - Meaning - Famous - Important - Submarine History - Timeline - Innovation - Significant - Development - Transportation - First - Submarine Definition - Kids - Facts - Information - Info - Who invented the Submarine - Dates - When - Why - Impact - Purpose - Use - New - Old - Amazing - Best - Definition - Meaning - Awesome - Cool - Renaissance (1350 to 1700) - Dutch - History - Submarine Timeline - Who Invented the Submarine?